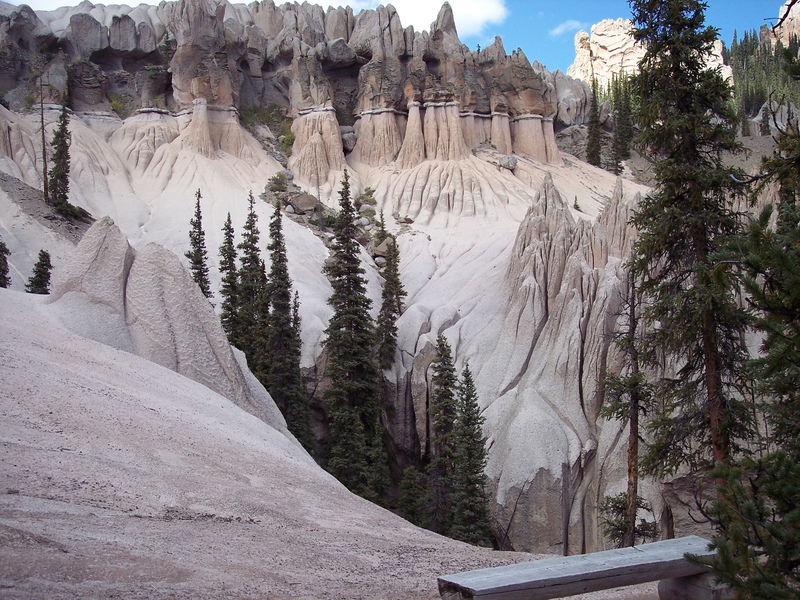 Wheeler Geologic Monument is a natural formation of rocks and volcanic ash. To reach the trailhead, drive about 7 miles southeast of Creede on Colorado 149, then turn left on Pool Table Road, #600 and proceed about 10 miles to Hanson's Mill. The two-wheel drive road ends here. The 4WD road to Wheeler leaves from Hanson's Mill. It travels almost 14 miles. Expect close to 8 hours of driving time and plan 10 to allow for some exploring. The road is slow-going over a rough, roundabout and rutted route. Take advantage of that to enjoy the spectacular scenery. Near its end, it is narrow and twisting through the trees. In the slippery ruts, maneuvering is a challenge. The road is impassable when wet and closed to vehicles in the spring. It typically opens in mid to late June, as early as Memorial Day in an exceptionally dry year. From Hanson's Mill, the four-wheel drive road is well-signed and marked with white arrows. All four-wheel drive travel is restricted to the marked roads only, with the exception that you may drive off the road for up to 300 feet to gain access to suitable undeveloped campsites along the route. You should stop by any Forest Service Office and obtain a Travel Map if you have questions concerning travel restrictions. The road climbs from Hanson's Mill through spruce/fir for 0.4 mile to a road junction. The left fork is not the four-wheel drive route to Wheeler but can be driven for a little over 1 mile where it dead-ends just before East Bellows Creek. From this point, the route continues as a trail (foot, horse, and trailbike only) for 5.7 miles to the Wheeler Geologic Area. This trail is part of the old Alder Creek Stock Driveway, which today is Trail #790. There is limited parking for 3 to 4 vehicles at the end of this spur road. If you prefer hiking, and are in good physical condition, you can probably walk to Wheeler faster than driving a four-wheel drive vehicle the 14 miles to Wheeler via the jeep road. If you plan to drive into Wheeler, however, go straight at the road junction rather than following this left fork of the road. The junction is well-signed. From this junction, the Pool Table Road#600 travels northeast, gently climbing 360 feet in elevation over the next 3.9 miles. The first 3 miles of this section of road continue through spruce/fir and then break into the open to follow the treeline on the right until the road swings northwest and crosses East Bellows Creek. The final half-mile of road breaks back into a small park and dead-ends at the fence marking the end of the road and the boundary of the Geologic Area. This is as far as motor vehicles are allowed. From this point a foot and/or horse trail continues approximately 0.6 mile on to the formations. Even though the trip is rough and slow, the subalpine scenery is beautiful and more than makes up for the trip. If lucky, elk and deer may be seen on occasion. Coyotes are not uncommon. Gray jays ("Camp Robbers") are plentiful, especially at the end of the road near Wheeler. If you have patience, you can usually have these friendly birds eat out of your hand. This trail write up was submitted by Diverboss. Glad I found the forum, seems like some pretty knowledgeable folk in here. I recently bought a Mule with 860 hours on it from auction and I've noticed a couple small issues I'd like to get some opinions on. 1. When the Mule is heated up, been driving 15-20 minutes, when going uphill, it'll have a really hard time getting out of a "low" gear and when trying to shift upwards, it will make a sound like it's not catching and won't pick up speed. If you push down on the gas, the noise gets worse, and you're not goin any faster. I've worked around this by stopping the mule, dropping it in neutral, leaving it running for about 30 seconds to 1 minute, then shifting back into drive and it'll go a little ways further before having the issues again. 2. When going from a stop uphill, the entire mule will shudder and shake while moving for the first few seconds, after that, it lets up.